The 40th Street Artist-in-Residence Program awards West Philadelphia artists 1 year of free studio space at 40th & Chestnut Sts. In exchange, residents share their talents within West Philadelphia by leading workshops, teaching classes, exhibiting, etc. Founded by artist Edward M. Epstein in 2003 and managed by Gina Renzi since 2008, we address the need for studio space in West Philadelphia, assist artists with career development, and make the 40th Street area a nexus for visual arts. 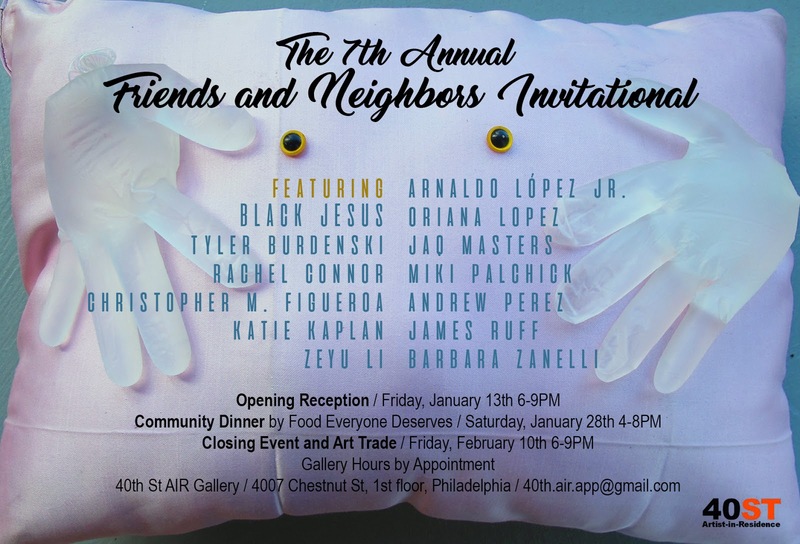 Once a year, the resident artists of 40th Street Artist-in-Residence Program (AIR), invite guests to exhibit work in our gallery. These guest artist come from a wide-array of backgrounds, from child to senior citizen, trained artist to self-taught, and of course friends and neighbors!!! This year, we will hold three distinct events as part of this exhibition and we hope that you will join us for all of them! Opening Reception: Friday, Jan. 13th (Today), 6:00PM- 9:00PM with informal talks from the artists and light refreshments at 7:00PM. Closing Art Swap Event: Friday, Feb. 10th, 6:00PM- 8:00PM Everyone is encourage to bring one piece of art (crafted by any one) to trade along with others. Good to know about the opening of this gallery. My sister is also opening an art gallery soon and we are planning to arrange the opening ceremony at grand event space. It will be really fun to arrange the party along with her. We both love arranging things. Email 40th.air.app@gmail.com to subscribe to our email newsletter.